Roewen Wishart explores the ins and outs of starting or refocusing your major gift fundraising – and helps you find essential linkages so you can fine-tune your major gifts program. Roewen Wishart explores the ins and outs of starting/refocusing major gift fundraising and finding essential linkages so you can fine-tune your major gifts program. 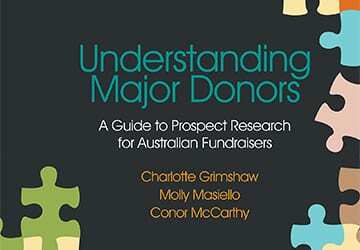 Australian major gifts and capital fundraising will benefit for years from the publication of Understanding Major Donors: A Guide to Prospect Research for Australian Fundraisers by Charlotte Grimshaw, Molly Masiello and Conor McCarthy. 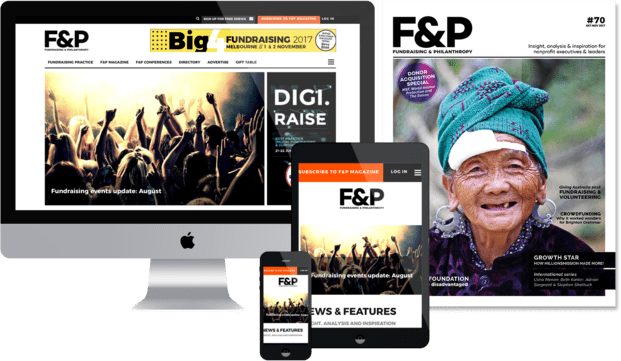 Fundraising managers and major gifts specialists face the challenge of how use the information generated by prospect research and apply it to decision-making, priority setting and planning. Here are two vexed questions, and some answers. Fundraisers commonly face one of two problems. One is: how to start a major gifts program with an established mass donor and/or ‘founding donors’ base. A converse is: how to refocus a major gifts program that has become swamped with too many prospects and staff time spent on activity that doesn’t generate enough ‘hot prospects’. Major gifts staff are trained to look for potential and to understand the need for cultivation steps to build donor engagement. It’s easy therefore to ‘hang on too long’, hoping that a donor’s or prospect’s engagement can be built. In both these cases, a new (or revisited) method of linkage, ability and interest scoring is a good place to start. The method covered in chapter four is a good practical guide. It suggests a five-point scale for each of the three criteria (effectively from ‘nil or nothing known’ to ‘very strong’). And it makes the important point that financial ability warrants extra weight; a donor with relatively weak demonstrated linkage and interest but very large giving ability warrants more attention than another donor with the same ‘total score’ but only moderate ability. The LAI scoring process usually starts with an apparent pool of ‘unqualified prospects’ (for example, anyone who gave $500 in the past three years, excluding peer-to-peer sponsors). If there are 150 unqualified prospects, a LAI scoring with just 0 to 2 for each criterion may be enough to select 80. But it there are 500, a more ‘finely graduated’ scoring from 0 to 5 makes sense. The second factor is the need to establish a regular review of prospects in a portfolio. Sometimes no personal, quality cultivation step is possible – due to a donor’s preference for privacy, busyness, low interest or absence of personal linkage. If this is unchanged after six months and several different attempts, it might be time to cease personal cultivation and try new possible prospects. Note for context here that LAI rating is most relevant to major gifts programs that are ‘staff driven’, that is, where all three criteria are necessary to ‘get off square one’. In case of capital and capacity campaigns that are more ‘volunteer advocate’ driven, interest becomes less important as an initial filter, and personal linkage of those advocates and ability to make a big gift are the starting point. Usually, big gifts will only result where genuine interest is subsequently built by cultivation. But at the start, linkage and ability can be enough. Often the single longest delay factor in approaching top prospects (even a charity’s own donors) is getting face to face. Often, the donors with the biggest ability to give are the busiest and hardest to reach. Chapter 8 gives good guidance. Note: LinkedIn continues to grow in value for this purpose, although don’t rely on your own LinkedIn account to find connections to a prospect. LinkedIn currently only shows mutual connections to a prospect who is ‘second level connected’ to you. Well-prepared phone technique can help get that first meeting. A solo major gifts officer in an organisation with no prior major gifts positions recently arranged a meeting with a BRW 200 individual who had only ever signed an online petition for the organisation. This happened by applying prospect research that identified a location of the charity’s activities of close interest to the donor, and a few well selected questions about how the donor’s business activities might overlap with the charity’s. But most of the time, it’s personal linkage that can get you face to face when the usual offerings (invitations to tours, board cocktails etc) don’t work by themselves. The tours and thank-you events still work (to motivate, appreciate, affiliate) but it’s a personal invitation by a person of influence that will increase the acceptance rate. An interesting side note here is that several experienced UK and Canadian fundraisers have commented on how different Australia is – donors simply not giving an RSVP or accepting then not coming with no notification, is very frequent by comparison. Which linkages found by prospect research are most effective? Longer personal connections beyond business and professional relationships are clearly effective, although less likely to be found via research of published information. Conversely, don’t assume that people who are both on the same board necessarily know each other well, particularly for professional non-executive directors. Consider the social and business obligations involved. For example, professional advisors and suppliers to a business may need to carefully ration the requests they make of people who are their clients and customers. But clients and customers will find it easier to invite their advisors and suppliers. Pay attention to residential location. Often, people who can be influential for your organisation will have a network around their home that is unrelated to their business or profession. This applies when doing ‘peer screening’ with your board members and ‘inner circle’. You can ensure that the prospect names they screen include those nearby. Of course, research won’t always find private addresses. For professionals interested in more, the Association of Professional Researchers for Advancement (APRA) has a newly formed Australian chapter (the first outside North America). Email enquiries to [email protected]. APRA Australia has its first conference in Melbourne on Monday 14 August 2017. There’s also the APRA Australia LinkedIn group, which has plenty of interesting and specific discussion. 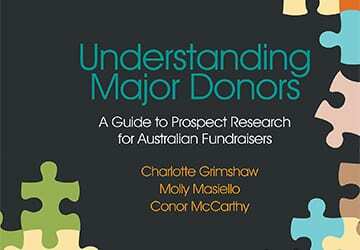 Charlotte Grimshaw, Molly Masiello and Conor McCarthy’s Understanding Major Donors: A Guide to Prospect Research for Australian Fundraisers is priced at $30 and available from fundraisingresearch.com.au. Roewen Wishart CFRE is Director of Xponential and has 25 years’ experience in fundraising. His specialties are fundraising strategy, major gifts and capital/endowment campaigns, gifts in wills, ethics and boards in fundraising. Next ArticleThe Funding Network: going live!